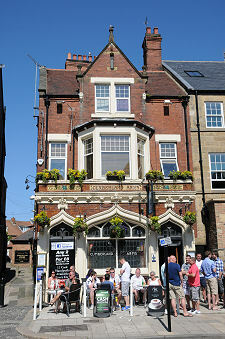 The town of Tynemouth stands on the north side of, as the name implies, the mouth of the River Tyne. These days the end of one part of the conurbation lying along the north bank of the Tyne is largely indistinguishable from the start of the next. Nonetheless, although Tynemouth blends fairly seamlessly into North Shields to its west, and Whitley Bay to its north, once you arrive it is possible to appreciate that it has a very distinct character all of its own. 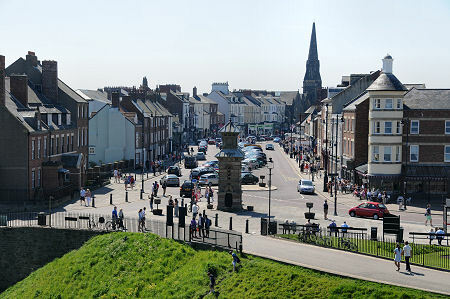 For a start, Tynemouth is an extremely attractive place. This is all the more so if, as we did, you catch it on a warm and gloriously sunny Saturday afternoon in late May. When we photographed the town there were crowds of people out enjoying themselves on Tynemouth Longsands, the mile long beach which looks out over the North Sea, and in King Edward's Bay, another beach, whose southern end is in the shadow, literally, of Tynemouth Priory and Castle. Meanwhile others were simply enjoying a drink outside one of the many pubs on Front Street, the street which forms the core of the town. 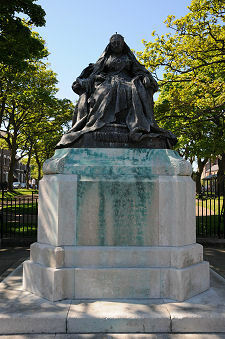 At the west end of Front Street, where it meets Percy Park Road, is a junction overlooked by the Queen Victoria Monument. This comprises a bronze seated statue by Alfred Turner on a base of Portland stone. The statue was unveiled in 1902, and has a slightly dumpy look which is emphasised by the base. The Queen had died the year before. The wooded square to the west is home to war memorials to the South African War and First World War. Queen Victoria looks out across Allendale Place and along the length of Front Street. A couple of hundred yards to the west, to the rear of the Queen, is Tynemouth Railway Station. This was built in 1882 for the North Eastern Railway Company, when it served the needs of Tynemouth residents and brought in large numbers of visitors from across Tyneside at weekends and on public holidays. Today the station is on the Tyne and Wear Metro, which continues to link the town to the wider area. 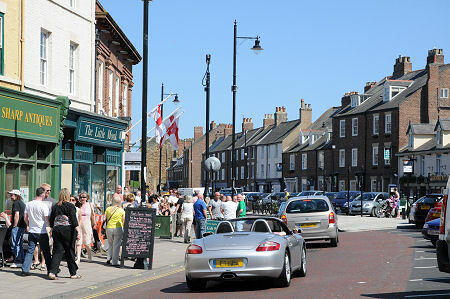 Following the attractive shopping street, Percy Park Road, which heads off to the left of Queen Victoria (from her point of view) brings you to the coast at the south end of Tynemouth Longsands. Your experience of this stretch of coast will very much depend on the weather: we suspect that in winter and with an easterly gale it might not look quite as enticing as it did when we visited. Dominating views north along Tynemouth Longsands is the darkly weathered 180ft high spire of St George's Church, built in 1884 by the Duke of Northumberland. There are a number of other attractions along the bay. Tynemouth Park includes attractions such as mini golf and the largest synthetic ice rink in the UK. You can also hire out pedalos on the boating lake, or simply sit at the cafe and watch the world go by. Nearby is the Childhood Memories Toy Museum, whose 6,000 exhibits evoke childhoods gone by. A little further north along the sea front is the Blue Reef Aquarium, whose aim is to educate about the marine environment in a fun and entertaining way. At the north end of Tynemouth Longsands is Cullercoats. This has a pretty natural harbour originally developed for the export of salt and the local fishing industry in the 1800s. Among the attractions here is the Cullercoats Watch House, built overlooking Cullercoats Bay in 1879 for the Cullercoats Volunteer Life Brigade. If you follow the coast round from the southern end of Tynemouth Longsands you come to the smaller but equally attractive and popular beach at King Edward's Bay. As already noted, the southern end of this is formed by the 100ft high cliffs which support this side of the substantial headland at Tynemouth. 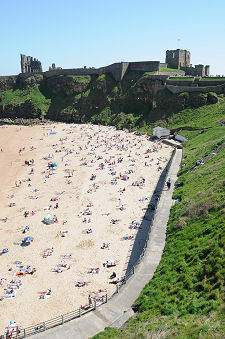 The headland is home to the remains of Tynemouth Priory and Castle, and we will come back to them. For the moment, let's instead pass by the imposing gatehouse that looks out towards the east end of Front Street, and descend to the surprisingly open area that lays behind Freestone Point, which marks the north side of the actual mouth of the River Tyne. En route you pass Prior's Haven. This lies within the shelter afforded by the 1,000m long Tynemouth Pier, which, on fine days at least, offers a great walk and an unusual view of the town and the headland. Prior's Haven is home to the local yachting and rowing clubs. To its south is the grassy area known as the Spanish Battery, a name that dates back to the building here of an artillery battery to command the entrance to the river. Today this forms a car park. Among the buildings overlooking the River Tyne is the Tynemouth Volunteer Life Brigade Watch House, a wood faced building which looks oddly as if it should be located on the east coast of the USA rather than in North East England. The Tynemouth Volunteer Life Brigade was founded in 1865 in response to a very particular danger. Immediately to the south, actually within the mouth of the River Tyne itself, are the the Black Middens, notorious rocks covered at high tide which have claimed the lives of many unwary mariners over the years. During a single three day storm in November 1864, five ships were wrecked on the Black Middens, with the loss of 34 lives, within view of many helpless local residents. The TVLB was formed in response. Today their watch house serves as a museum to their achievements. Close by is the huge Collingwood Monument, erected in memory of Vice Admiral Cuthbert Collingwood, born in Newcastle. So far we have sidestepped any discussion of the most obvious, and most important, feature of Tynemouth, the headland which dominates the mouth of the River Tyne. We tell the story of Tynemouth Priory and of Tynemouth Castle on separate features for each of them, even though "Tynemouth Castle" is a slightly misleading phrase, as the defences here were initially for the Priory, and later to guard the Tyne. The story of Tynemouth started on the headland. Evidence has been found here of a settlement in the Iron Age, which continued in use (or was reused) during the Roman era. An Anglo-Saxon monastery seems to have been built here in the mid 700s, and this was destroyed by Vikings, probably in 875. By 1050 the headland at Tynemouth was occupied by some sort of manorial complex that was sufficiently important to have been visited on a number of occasions by Tostig, Earl of Northumberland. This was destroyed by the Normans in the years after the Conquest, and a religious settlement was re-established in 1083. 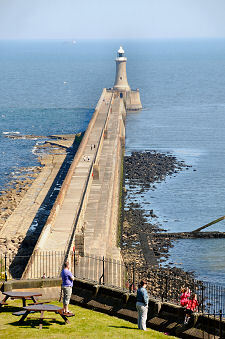 In the centuries that followed, a settlement developed to the west of the Priory Gatehouse, on the site of modern Tynemouth, though for the monks of Tynemouth Priory their investment in developing a harbour for fishermen and trade at nearby North Shields in the 1200s was of more importance. After the Priory was suppressed in 1539, the headland's wider defensive role came to the fore, and it remained a military base right up until 1956. Today no visit to Tynemouth can be considered complete without touring the Priory and Castle.